Welcome to LSU Law Center’s Career Services Office! We are dedicated to assisting students and alumni with career and professional development. Our goal is to help each student define career objectives and identify employment opportunities based on individual experiences, interests, values, skills and geographic preferences. Law school is an investment in your future, and your experience here should extend beyond the classroom. 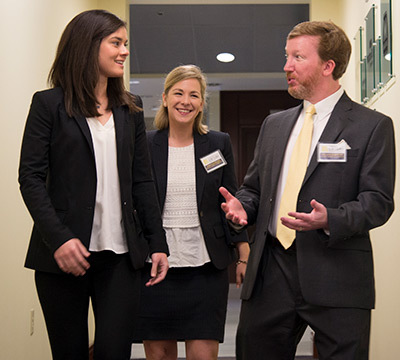 At LSU Law, students have a wide variety of opportunities to develop practical legal skills through working in private law firms, internships, field placements, participation in the Law Clinic, and experiencing simulated “real world” law practice through the trial advocacy program. We are committed to position our students to be prepared to practice by the time they graduate. We invite you to take advantage of our many resources and programs. It is never too early to begin thinking about your future as a new lawyer and your career goals. We are committed to providing students and alumni with a wide variety of career planning and job search resources to assist in your search for employment during law school and after graduation. The Career Services Office sponsors a wide variety of career-related programs throughout the school year. These programs are designed to promote early student self-assessment, pique students’ interest in specialized areas of legal practice, and encourage students to think about job opportunities as they develop a post-graduation employment plan. LSU Law Center’s rigorous curriculum, the quality and accessibility of the faculty, and our unsurpassed record over time in state bar passage rates mean LSU Law students have the training, knowledge and skills needed for successful employment. Our students are able to pursue individual career plans, whether in Louisiana, another state or internationally. The curriculum at LSU Law Center prepares you for today’s global economy. Within 10 months of graduation, 91% of graduates from the class of 2015 were employed, and 83% of the graduates were employed in positions where bar passage was required. An additional 12% were employed in positions where J.D. was an advantage. The chart and table below provide information on the employment statistics of the class of 2015. The LSU Law Career Services Office would love to hear from you. Whether you have a question, have something to say or are in need of information, please feel free to call, email or write us.